Human-elephant conflict has become very stark in Assam driven by habitat loss and an expanding human population. Man-elephant conflict has resulted in many human deaths being caused by elephants and vice-versa. 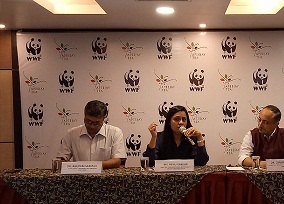 Taking the said problem into consideration, Apeejay Tea Limited in tandem with World Wildlife Fund (WWF India) has found out a way to deal with the growing problem of human-elephant conflict in Assam – installation of low-cost solar power fence and bio fence in the tea garden areas. Apeejay Tea and WWF-India started the project in 2015 in Sonitpur district of Assam which is referred to as a ‘ground zero for human-elephant conflict’. WWF India Brahmaputra Landscape team leader Anupam Sarmah informed that low-cost solar power fences have been installed in four tea estates – Borjuli, Ghoirallie, Dhulapadung and Sessa tea estates belonging to Apeejay Tea Limited in Sonitpur district. Sarmah also informed that Apeejay Tea Limited and WWF India have been holding village-level meetings, interactions with anti-depredation squad (which comprises villagers as members who are trained to tackle man-animal conflict), orientation and organising street plays across the tea gardens in Sonitpur district of Assam so as to create awareness on how to manage man-elephant conflict. A short educational film Hamara Ghar on peaceful co-existence was screened during the Press conference. Anupam informed that the Assam Forest Department provided all kind of “logistic support” during the implementation of the said project.